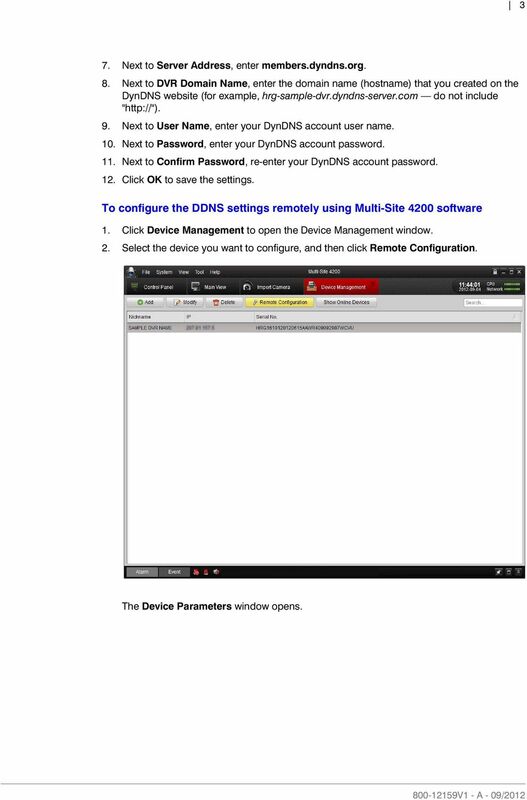 Download "HRG Performance Series DVR DDNS Support Application Note (DynDNS)"
2 2 DynDNS Support Application Note 2. Select the DHCP check box to enable DHCP mode and configure your router to assign a specific IP address to your DVR based on its unique MAC address. Refer to your router s user manual for details. (If DHCP mode is enabled, the Preferred DNS Server and Alternate DNS Server fields can be left blank.) Note If your DVR is configured to use a static IP address rather than DHCP, you must fill in the Preferred DNS Server and Alternate DNS Server fields to use the DDNS feature. Contact your network administrator to obtain the preferred and alternate DNS server IP addresses. 3. Click the Advanced tab. 4. Next to DDNS, click Set. 5. In the DDNS window, select the DDNS check box to enable the DDNS feature. 6. Next to DDNS Type, select DynDns. 4 4 DynDNS Support Application Note 3. In the left navigation pane of the Device Parameters window, click Network, and then click the Advanced Settings tab. 4. Next to DDNS, click Set. The DDNS Settings dialog box opens. 5. 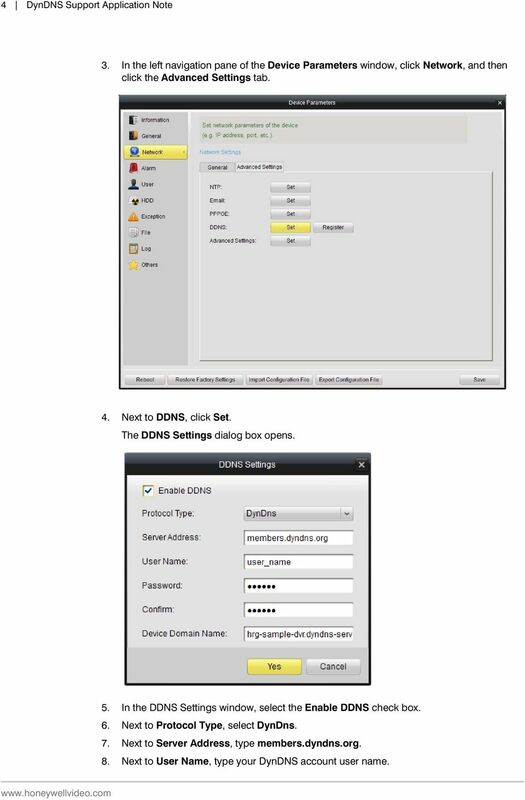 In the DDNS Settings window, select the Enable DDNS check box. 6. Next to Protocol Type, select DynDns. 7. Next to Server Address, type members.dyndns.org. 8. Next to User Name, type your DynDNS account user name. 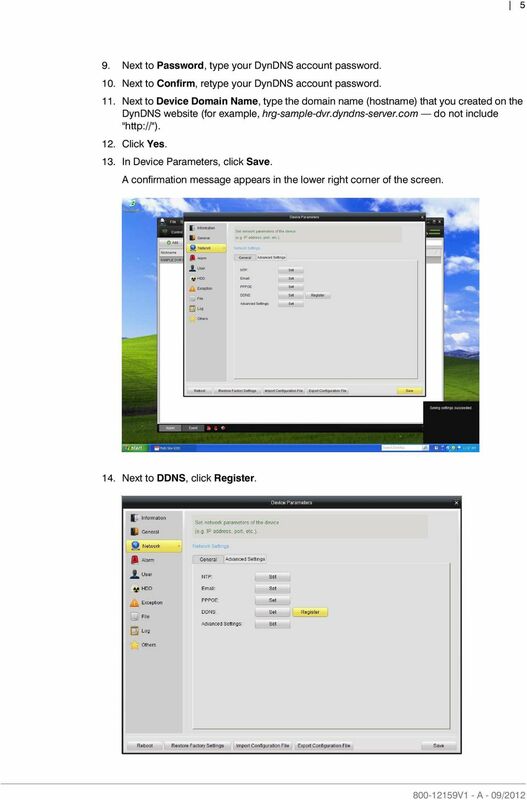 6 6 DynDNS Support Application Note Accessing the DVR You can access your HRG Series DVR using DDNS via a web client or via an app installed on your mobile device. 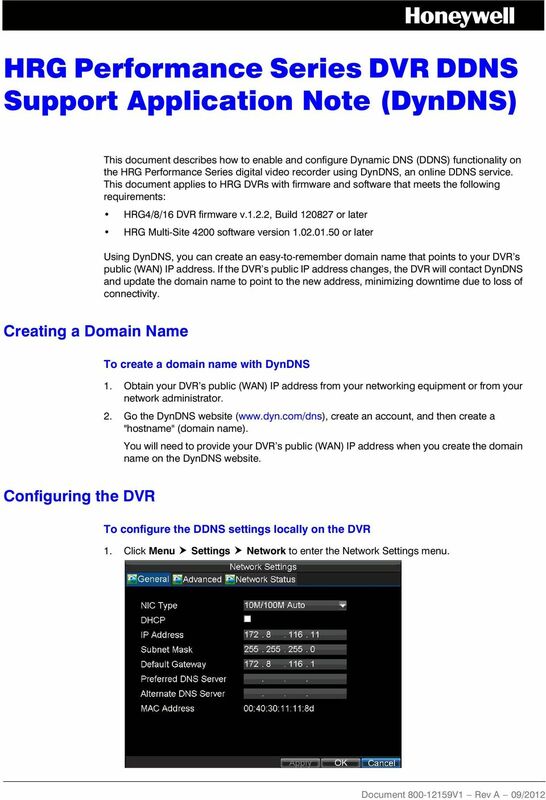 To access your HRG Series DVR using a web browser Enter your DynDNS domain name, followed by the port number of the DVR that you want to access, in the address bar of your web browser. 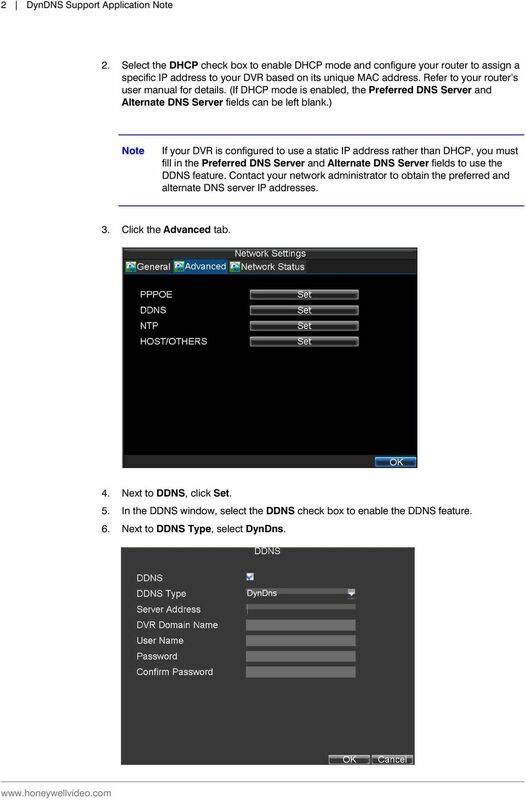 Use the following format: name]:[http port number] Example: To access your HRG Series DVR using the HRG mobile apps In the device settings, set the Register Mode as Domain, and then, next to Address, enter your DynDNS domain name. For detailed instructions, refer to the HRG App for Apple ios Devices User Guide ( ) or the HRG App for Android Devices User Guide ( ). 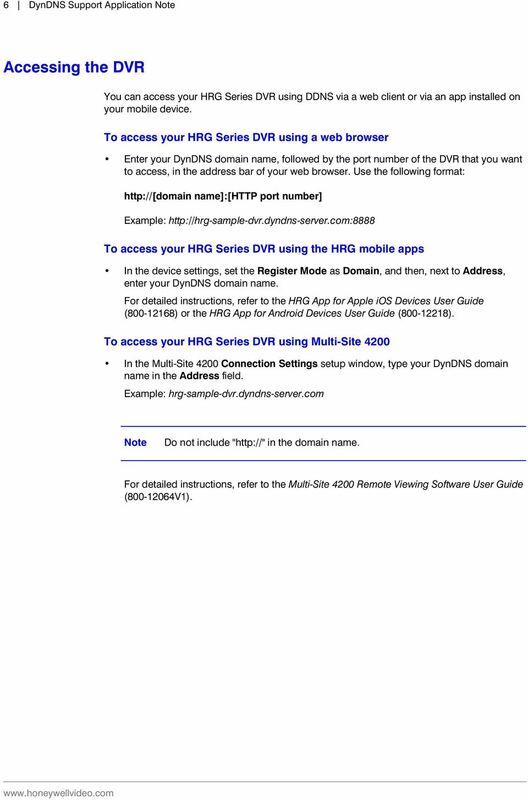 To access your HRG Series DVR using Multi-Site 4200 In the Multi-Site 4200 Connection Settings setup window, type your DynDNS domain name in the Address field. 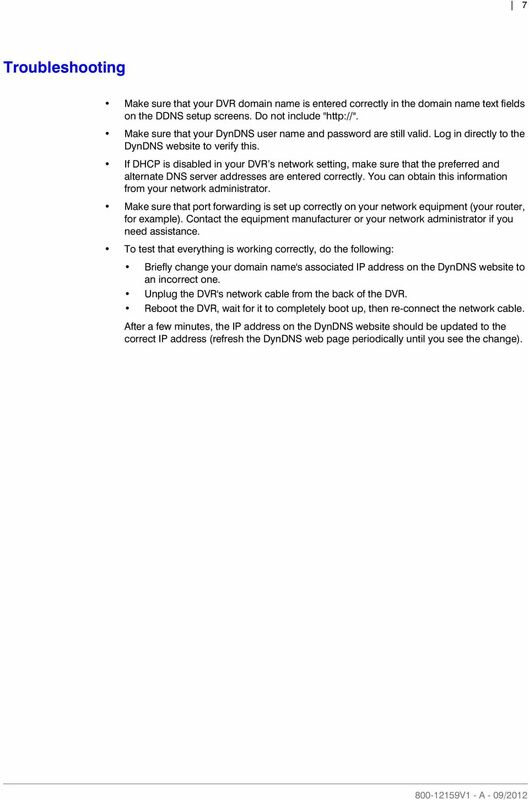 Example: hrg-sample-dvr.dyndns-server.com Note Do not include " in the domain name. For detailed instructions, refer to the Multi-Site 4200 Remote Viewing Software User Guide ( V1). 8 (North America only) Document V1 Rev A 09/ Honeywell International Inc. All rights reserved. No part of this publication may be reproduced by any means without written permission from Honeywell. The information in this publication is believed to be accurate in all respects. However, Honeywell cannot assume responsibility for any consequences resulting from the use thereof. The information contained herein is subject to change without notice. Revisions or new editions to this publication may be issued to incorporate such changes.